May we suggest packing lightly? Las Vegas luxury shopping has never been presented this extravagantly. From designer boutiques to Bellagio signature shops, you're sure to find something to suit your taste. 39 Quai de l’Horloge. It is here that Abraham-Louis Breguet opened his workshop on Paris’ Ile de la Cité in 1775. From these doors came not only the timepieces for Napoleon, Marie-Antoinette, the Queen of Naples, Czar Alexander, King George IV and other nobles of the world, but as well technical and aesthetic watchmaking innovations such as the tourbillon, the Breguet overcoil, the parachute antishock, guilloche dials, pomme hands, Breguet numerals and many others, that 200 years later, remain core to the art. Our link to the richest history in all of watchmaking inspires, as it should, what we do today at Breguet. But tradition and heritage must be seen in context. Abraham Louis Breguet was the greatest watchmaker who ever lived, but what made him tower over not only his peers during his lifetime but those following was his overpowering drive to invent and create. So our inspiration from the past is not simply modern recreation of Breguet’s inventions and designs, but the passion to devote ourselves just as tirelessly as our founder to invention and innovation. That really is the true legacy of Breguet, an endless quest to expand the frontiers of watchmaking. Featuring designer sportswear, dress and swimwear collections, in addition to a carefully selected variety of upscale handbags and jewelry, this vibrant store appeals to fashionable individuals favoring a relaxed, multifaceted lifestyle. The collection of stylish labels available includes Bally 44, DVF, Isabella Fiore, John Hardy, Just Cavalli, Joseph Ribkoff, Karen Kane, M Missoni, MRK, Michael Kors and Trina Turk and Yoana Baraschi. Add finishing touches with jewelry from Alexis Bittar, John Hardy, Jude Francis and Monica Rich Kosan. 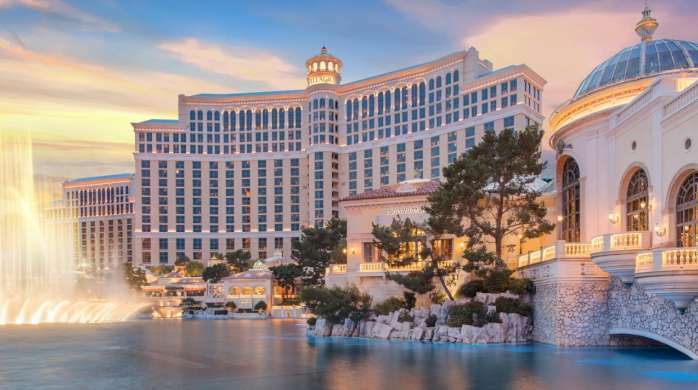 Located near the Bellagio Gallery of Fine Art and the Main Tower Guest Elevators. Along the Promenade Shops, Located near the Bellagio Gallery of Fine Art and the Main Tower Guest Elevators. The House of Chanel upholds a commitment to style, innovation and creativity, in a tradition established by its visionary founder. Gabrielle 'Coco' Chanel reinvented fashion by transcending its conventions, creating an uncomplicated luxury that changed women’s lives forever. Chanel continues, after almost a century, to inspire women of all ages around the world with its timeless modernity. Visit the boutique to discover this season's most coveted collections, timepieces and fine jewelry. Capture the magic of Cirque du Soleil's magnificent production, "O™", with gifts from the Cirque du Soleil store located outside of the "O" Theatre entrance. Escape for another intriguing journey through the circle of life with incredibly beautiful songs from the show on CD, signature apparel and other unique items. Outside of the "O" Theatre entrance. Bellagio logo apparel for adults and children, accessories, gifts, and souvenirs. Gourmet snacks, wine and spirits, refreshments, sundries, and other essentials are also offered. Offering a wide array of garden-oriented gifts and decorative items for the home and garden. Decoratives from well-known design houses, such as Jay Strongwater, Eva Gordon, MacKenzie-Childs and Intrada Italy are offered. Fresh florals are also available. SINCE 1828 GUERLAIN has been exploring, innovating and enhancing in the realms of fragrance, skincare and make-up -- a brand devoted to the culture of the beautiful. GUERLAIN’s founder, Pierre-François-Pascal GUERLAIN, opened the first boutique in the heart of the French capital, at 42, rue de Rivoli. 180 years later, five generations of perfumers have followed in his footsteps to oversee the creative process and leave an indelible mark in the world of perfumes. Rooted in the origins of its master craftsmen and visionaries, GUERLAIN continues to keep its cutting edge position and to demonstrate its savoir-faire and passion in creations a quest involving daring designers, legendary creations and timeless expertise. Like a drop of perfume behind the ear, at the nape of the neck, on the inner wrists or in the décolleté, where the fragrance blends seamlessly with the skin to create a unique scent, GUERLAIN has left its mark on the history of modern fragrances. With a series of olfactory creations that tell tales inspired by romantic encounters, literary classics and journeys to distant lands, certain fragrances have stood the test of time and continue to perfume the air with their exceptional aromas: L'Eau de Cologne Impériale, Jicky, L'Heure Bleue, Mitsouko, Vol de Nuit, Shalimar, and Vetiver. An unparalleled range of fragrances to indulge the senses. A worldwide leader in luxury since 1854, Louis Vuitton has become synonymous with the art of elegant travel. Its leather goods are renowned throughout the world for ultimate quality, craftsmanship, innovation, and stylish luxury. Logo items, magazines, newspapers, refreshments, sundries, wine, wine accessories, gourmet snacks, spirits and sun care. Via Fiore, near the Spa Tower guest elevators. As the leading retailer of luxury eyewear, Optica offers the finest assortment of optical frames and sunglasses from several premier luxury brands including Cartier, Chrome Hearts, Mykita, Dita, Chopard, Prada, Gucci, Chanel and more! Plus, Optica is the exclusive distributor of the Morgenthal Frederics line of eyewear. Platino offers a variety of the finest men's ready to wear and made-to-measure fashion, each reflecting a word of elegance, refinement, and sophistication. Platino carries a hand selected collection of outstanding and prestigious brands including Zilli, Ravazzolo, Belvest, Gerlin and Brioni, all under one roof. Located near the Main Tower Guest Elevators and the Bellagio Gallery of Fine Art. Sophisticated and trendsetting, Prada's inspiring concept of uncompromised quality and constant innovation has endured from 1913, when Mario Prada, Miuccia Prada’s grandfather, opened a shop of luxury goods in the Gallerie Vittorio Emanuele in Milan. The search for rare materials and sophisticated manufacturing techniques apply to each and every Prada product. We invite you to experience the gift of magical energy shared by Cirque du Soleil and Richard MacDonald that has drawn them together to create The Art of Richard MacDonald presented by Cirque du Soleil Fine Art Galleries. Located directly inside the “O” Theatre lobby and The Shops at Crystals in ARIA Campus, the Art of Richard MacDonald gallery features over 100 bronze sculptures including twenty heroic sized works along with original drawings, paintings and limited edition prints by the artist. Gallery space available for private and corporate events. Please call us for more information. Shine in any spotlight with elegant precious jewelry and exceptional timepieces and watches from Tesorini. A crown jewel in its own right, Tesorini is a dramatic showcase for collections of luxurious brands that are renowned for their quality and timeless style. Featuring desirable watches from Rolex, Patek Philippe, Breitling, Officine Panerai, and Jaeger-LeCoultre as well as acclaimed jewelry from Roberto Coin, Chopard, Garavelli, Pasquale Bruni, Tamara Comolli, and Mattia Cielo. Listen to Roberto Coin speak about new designs. Discover a fine array of basic essentials, as well as luxurious items to enhance the joy of everyday life. Shop Tutto for Bellagio At Home amenities, Bellagio Gift Cards, logo apparel for men and women, novelty items and wonderful gifts for the home. Adorable children's apparel, Elaina London Jewelry, popular skin and hair care products from Fresh, Molton Brown and Moroccan Oil, in addition to an array of beverages, candy, cigars, fine wines and spirits make shopping at Tutto a pleasure, and gift giving easy. Located adjacent to the Main Tower Guest Elevators. Established in Rome in 1962, the Valentino fashion house is one of the highest expressions of couture savoir faire and the excellence that has made Italian products famous worldwide. Maria Grazia Chiuri and Pierpaolo Piccioli have been its Creative Directors since 2008. Condensed and simplified, the fashion house's iconographic legacy has been reinterpreted and recontextualized. The boutique will carry women’s ready-to-wear, handbags and shoe collections. Volaré is the premier destination for luxury travel goods. Come view our uniquely curated assortment of the most exceptional travel brands the world has to offer. Featuring Tumi, Brics Samsonite and more.